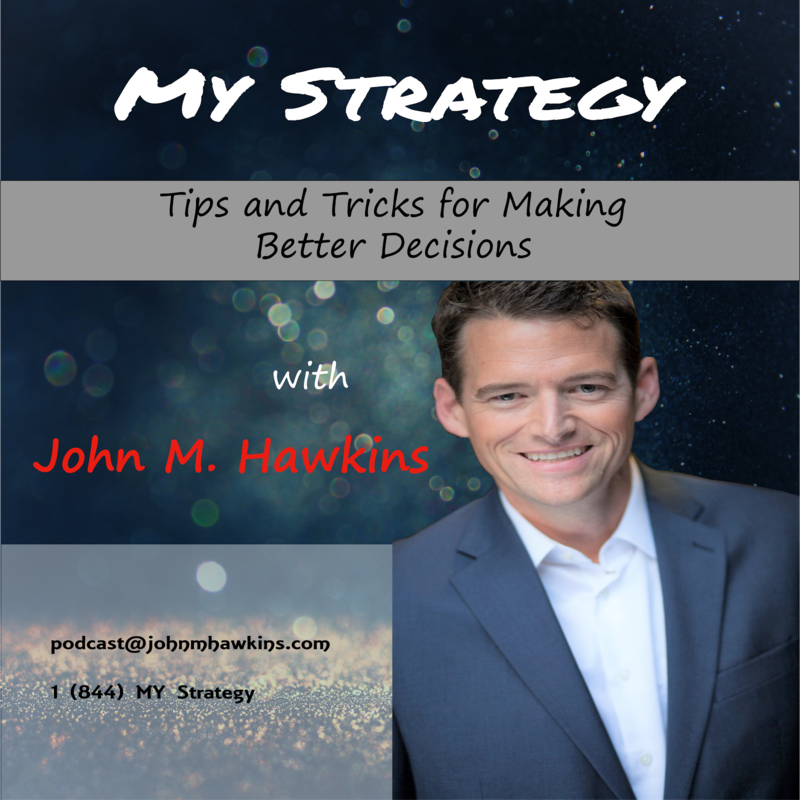 John M. Hawkins: Some Change is Good, But Too Much Change Can Create Chaos! Percent change might just be the best way to predict when change is good or too much! A little change can help you see things in a new light, or from a different perspective – but change that happens too quickly, or even not enough change for that matter, over a period of time can lead to unrest and chaos. If my assertion that change can cause confusion is correct, then why are many successful leaders quoted for their change statements. 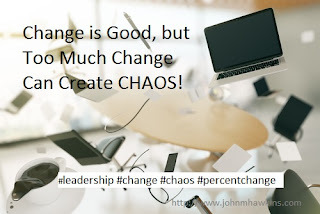 Winston Churchill was attributed as saying; “To improve is to change; to be perfect is to change often.” Does this quote contradict my opinion that too much change can cause chaos? Or consider Maya Angelou’s statement on change; “If you don't like something, change it. If you can't change it, change your attitude.” This is an interesting position on change; perhaps we need to change our attitude so we can accept change. These quotes are all taken out of context, to truly be able to determine if the quotes apply in a given situation we would need to understand the ‘current situation’ of the organization (or entity), the ‘future situation’, and the time frame of the change - otherwise the quote at face value may or may not apply in every situation. And if it doesn’t apply, then perhaps change would hurt, not help. Imagine that you wake up every morning then follow your standard routine on your way to work. Daily you stop by your favorite coffee shop. One day you walk into the coffee shop and find that an unfamiliar face greets you, after a few questions you find the coffee shop is now under new ownership. Day two; you find that the coffee shop hours have changed, they now open 30 minutes after you typically get there. Day five they increase their prices, and in addition to the price increase went to a lower quality coffee bean. Change too quickly created CHAOS! Many of us have expectations, but when change happens too quickly we notice! If this happened to the coffee shop that I frequented, then I would be the first to vote with my dollars and find a new coffee shop – one that provided the coffee experience that I wanted. Organizational change that causes unrest can be significant such as a key leader change, a policy change, cutting off key programs; even some seemingly insignificant change can have a dramatic impact. Without action from the organization's leadership team, the organization can loose it’s compass as members develop a sense of apathy, disengagement, or even resignation from the organization, which can lead to a chaotic feeling amongst organizational members. As a business owner or leader of an organization, it’s incredibly important to keep in mind that change can be good, but we want to be careful that there is not so much change that it creates fear, uncertainty, and doubt in the members who are part of the organization. Thinking about change, I thought to myself how one could quantify when a change might impact an organization either positively or negatively? It dawned on me that we could quantify it regarding Percent Change. A 10% change isn’t really a lot of change. If you’ve got a dollar and get 10% more, you’ll have $1.10. 90% of a dollar is $0.90. Imagine 200% of the dollar, then you’ll have significantly more money – you’ll have $2.00, double the money. There is a programmatic way we can simulate if a change will have a negative or positive impact to an organization or entity. By taking the Percent Change formula and plugging in two variables, it’s theoretically easy to determine if folks would be happy or unhappy just based on the percentage of change. We can calculate the percent change by taking the ‘Future Situation,' subtract the ‘Current Situation’ and divide that by the ‘Current Situation’ – then multiply by 100, and you’ll have the percent change. If Percent Change is positive, you might want to think about ways to maintaining the new situation. Assuming a ‘Current Situation’ as represented by 100 (I just picked a number for the sake of the model). And the future ‘Future Situation’ potential values could be 40, 50, 75, 100, 125, 150 and 175. We could then calculate the percent change, which I’ve done and is represented in the table below. The larger the percent change (or deviation from the current situation) will be the situation with the greatest potential for chaos. Here we see that negative change at -60 might also lead to chaos, on the flip side a +75% change could also lead to pressure and potential chaos. When sitting down to solve a math problem with one unknown variable, it can be simple if you have something like (4 + X = 10). You don’t need to be a math wizard to take the X and replace it with a ‘6’ – and fairly confidently you’ll have the answer. Organizations typically have many variables in the equation - and this is what can make decision making difficult. Now, imagine that you have got your percent changes formula and instead of plugging in two numbers you have an expression you need to figure out first. The sample math problem, like a changing entity, can get more complicated when we modify or add variables. Now imagine trying to calculate the more complex future situation of ((2+Z) + 2Y = 10) and adding in the leader change (perhaps a power of 2) – the formula gets more complicated ((2+Z) + 2Y = 10)2. The more complicated the problem, the less confident we are that we can quickly solve it, so true is for organizational change. I think that it’s probably fair to say that many people enjoy change, but the changes we like best are the ones that impact us in a positive way. When the percent change between the ‘future situation’ and the ‘current situation’ becomes too drastic, it can put stress on the organization or entity. Making policy, organizational or leadership changes might seem innocent enough. However, these changes can have a great impact. If you don’t like the chaos created by the change, the simple answer is to just take yourself out of the equation by disengaging with the organization or entity. Alternatively, you can choose the ‘current situation’ that you want to be a part of, essentially putting yourself into an equation that you’d prefer. If you’d prefer not to leave the organization, then engage and become part of the solution, or just wait and given enough time things will change. I think it’s fair to say that we all want ‘positive’ change, which is human nature. However, I suspect that if we had all the change we could hope for, then odds are we would still not be happy. Let me know your thoughts on the topic of change, I’d be particularly interested to hear about case studies or other insights into how you think about change.